Well, good morning, lovely people! 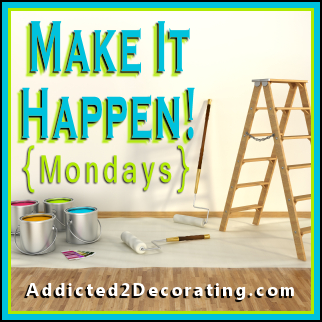 Welcome to another Make It Happen Monday! Today, for the first time in a long time, I have such a sense of accomplishment. I don’t know what has gotten into me over the last few days, but I have such a drive…such a determination…to get things done around the condo. And things are getting FINISHED!! I’ve noticed that working on this condo for me is a lot like the battle to lose weight. Getting started was the absolute hardest thing in the world, and everywhere I looked, I saw huge obstacles standing before me. But if I just dive in, and start doing a little bit at a time, I start seeing results. And then when I see results, it makes me want to press on to see even more results! Okay, enough philosophizing and psychologizing (yep, that’s actually a word). 🙂 Here’s my useless-bookcase-turned-amazingly-practical-and-pretty pantry. 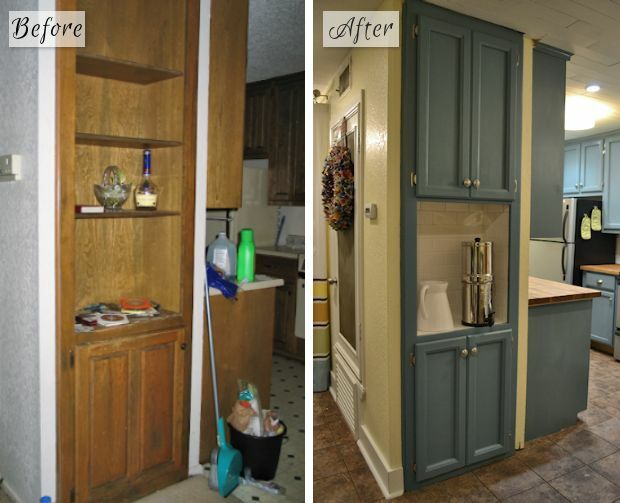 Doesn’t it look like it was always supposed to be a pantry?! I left the center section open (and tiled it) specifically to house our Berkey water filter. Now I just need to figure out what to put next to it. And in case you’re new around here, I’ll show you how it started out. Here’s the before and after. And again, please remember that I took the before picture minutes after we were handed the keys to our condo. The electricity wasn’t even turned on at the time, and all the junk is stuff that the previous occupants left behind. I was a bit anxious to take my before pictures. Now I wish I had taken a few minutes to clear away the junk, just because it’s distracting. Oh well…hindsight is 20/20, isn’t it? And do you notice another project I tackled in the kitchen? Yes, I refinished my butcherblock countertops. For the fourth time. I know you think I’ve gone insane, and perhaps I have, but doing this particular finish on my countertops was the best decision ever. I’ll share more about that later this week. I’m also in the process of giving my kitchen light a little makeover, so I’ll share that as well. So what have you gotten accomplished around your home in the last week? Have you tackled any lingering unfinished projects? Did you get any of those projects finished? I’d love to hear about it! And if you have a link to a blog post about your project, please feel free to share it in the comments below. that looks gorgeous, i love the cabinet color! we’re sooo close to being finished with our basement project. basically we took it from a space that was once the garage to a fully finished basement with half bath. right now, we’ve got some paint on the walls, bar cabinets built, fireplace and tv area built, and tiles laid. wahoo! Sounds like you’ve gotten a ton of work done so far! Love the color on your fireplace, as well as the whole retro look you’re going for. Can’t wait to see it finished! This looks perfectly planned. Like you said it’s like it’s always been there. I like the tile. 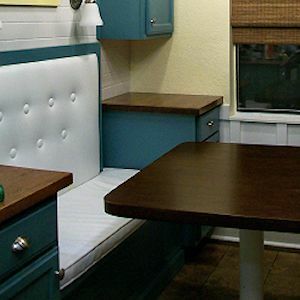 What a great little station for stagging or a coffee center. I like drawing design, very nice. 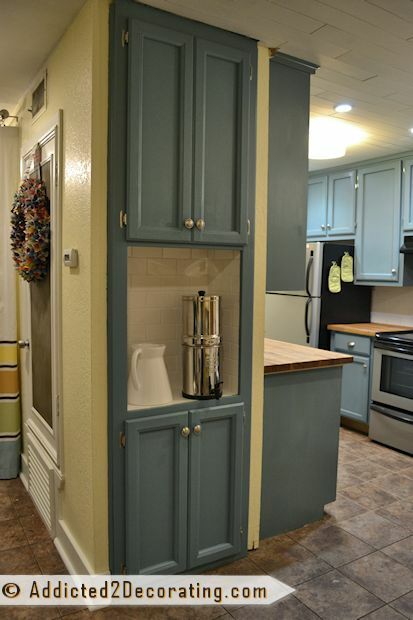 I love your idea of turning that space into a pantry. Perfect storage solution. Yes, I am finally getting some things accomplished around the house (in between working full time). This weekend I finally got a little fall decorating done and we finally started painting the house exterior. We have been scraping and sanding in our spare time and now have finally been able to start the painting process (which is going much faster) and I am loving it. I hope to have pictures to share soon. Oh yeah…the scraping and sanding are such a pain, but the painting is the fun part! So glad y’all are making progress on it. I’ve never painted a house exterior before. Can’t imagine how time-consuming that must be!! It looks great. In fact your whole condo (that I can see in the picture) has had an amazing transformation! Good work. Well, don’t let me fool you. The camera shot was strategically angled. 🙂 I still have a LONG way to go on this place! But it’ll get there!! It looks GREAT!!! I know you are proud of it. Thank you, Mom! I am QUITE proud of it. 🙂 It should have been a pantry from the beginning! Ha! I. LOVE. IT. It adds so much to your kitchen/dining area. That is so true. Every architect/builder needs to have a homemaker as a consultant when designing kitchens/living areas. With improvements like your pantry, you are also adding to the storage space the value of your condo. I hope you will be able to sell it quickly and get the home you are dreaming of. Kristi, WOW another great post. I love everything about it, the colors, the finishes. Looks perfect for entertaining. I love how you brought the flow in from the kitchen. I was just told this weekend at lunch by a NYC/Worldwide advertising professional “that women thrive creatively the older they get…” just a theory. It looks fantastic, Kristi! Yes, just like it was always there! You did a beautiful job. I wish I had gotten more accomplished last week, but hopefully I will be back on track this week. Looking forward to the light reveal and the countertop post! Great job and I can totally relate to your weight loss analogy, unfortunately. It’s so hard to get started, isn’t it? I do think a sense of accomplishment is addictive, too. I’ve been on a spending spree for the last 3 weeks and now it’s time to start sorting out the spoils and getting started on the projects. (I have to spend now and stock up on projects before the summer ends and the estate/garage sales dry up). So many projects now….sigh. Yay for YOU 🙂 Looks great! I did, I now have a retail location for my paint and I’m working on the display piece. Look forward to your fix for the counters,I know that has been a thorn in your side! Awesome after! It looks so much nicer painted with the added doors and I’m really digging the subway tiled mid-section! I’m not sure I would have ever thought to do that to a built in shelf, but now that I’ve seen it, it makes perfect sense. You definitely should be so proud!!!!! That came out great. 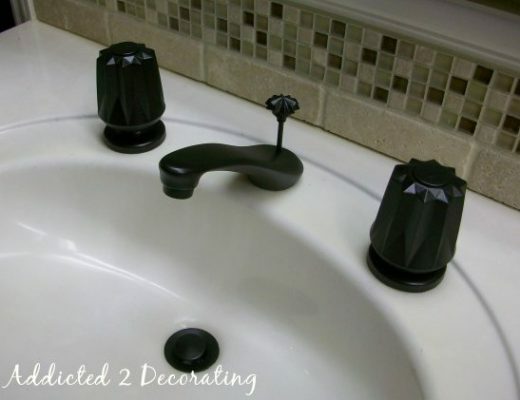 I simply adore the color of your cabinets & then the complimenting counters & floors. Really beautifully done! this is so great, looks so beautiful and perfectly built in! Kristi, this is a great project! I love the pantry. And although I am a book-lover too, and my house is full of bookcases, I am well aware that open storage can make small spaces seem cluttered — even when it’s neat (and good luck keeping a pantry neat 100% of the time). I bet your dining area looks more spacious because of those great doors! I absolutely love what you did with the built-in bookcase. Beautiful!! I love this. I vote for a coffee bar and maybe even one of those large containers for lemonade or tea for company. Nice-looking kitchen cabinetry. Just looking at them makes me feel right at home. I love it. Good job! My kitchen cabinets are light brown, a contempo-country style. A local company called dayoris (dayoris.com) custom-built them. I can see your kitchen will be used countless times. I dislike those neat kitchens that nobody ever uses. What are kitchens for anyway? Very nice, clever and efficient use of space! 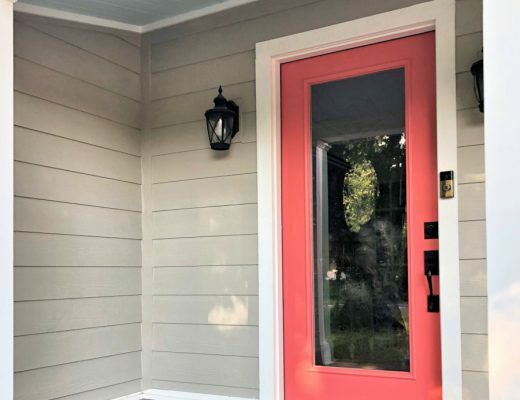 You have got to write a book someday for all the people who want their homes to look pretty and function well, but who think they lack imagination, color sense, ability, tools, etc. You make everything look do-able! Give this gal a TV contract!